The Charlotte Mecklenburg Library is proud to announce the reopening of the Morrison Regional Library at 7015 Morrison Boulevard, Charlotte, on Saturday, December 16, 2017 at 8:45 am. The library will be open to the public immediately following a ribbon cutting ceremony with activities planned throughout the day. The renovated branch, the third most active in the Library system, increased by 2,600 square feet to nearly 27,000 square feet, and includes redesigned spaces for children and teens, a maker space room, a vending café, and a patio and terrace. There is a wide selection of books and audio visual materials including DVDs, CDs and audiobooks. Features include a new computer lab, a laptop check out system, Wi‑Fi availability, and the ability for wireless printing from personal devices. Morrison Regional Library is open Mondays through Thursdays 9 a.m. to 8 p.m.; Fridays and Saturdays from 9 a.m. to 5 p.m.; and Sundays from 1 p.m. to 5 p.m. Hours may vary in summer. The Morrison Regional facility is also updated with automated materials handling and increased digital offerings. 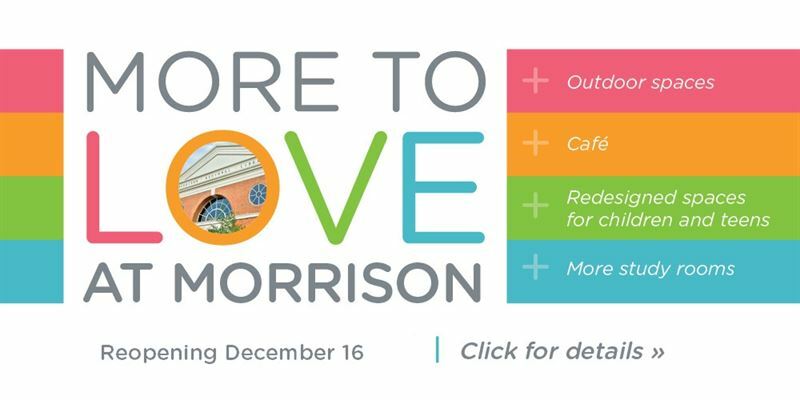 Public funding for the Morrison Regional project was approved in 2014 and cost approximately $8 million. The renovation is the first of several projects for the Charlotte Mecklenburg Library system. Created as a non-profit 501(c)(3) in September 2012 in partnership with Foundation For The Carolinas, the Foundation supports the Library’s programs and services through advocacy, fundraising and building relationships with others who share a passion for the Library’s work. The Library Foundation supports library services, expands the Library’s collection of print and digital books and materials, enhances programming for all ages, and strives to grow its endowment for future generations. Features include a new computer lab, a laptop check out system, Wi‑Fi availability, and the ability for wireless printing from personal devices. The library will be open to the public immediately following a ribbon cutting ceremony with activities planned throughout the day.